While their attempts to understand the workings of capitalism led them to the conclusion that the advanced societies of Western Europe were those most likely to be the setting for a successful socialist revolution, Marx and Engels by no means ignored developments outside this region. Indeed, given the configurations of international politics in their time, plus their conception of capitalism as a universalising system, they believed that some of the forces working for change in less advanced regions could even affect the prospects of a proletarian revolution in Western Europe itself. 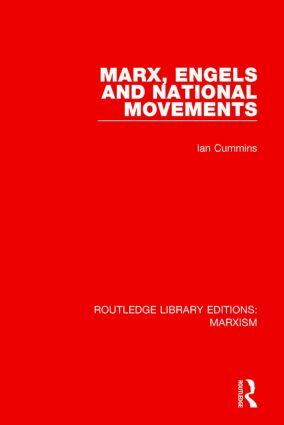 This book, first published in 1980, traces the development of Marx and Engels’ attitudes towards, and relations with, the principal national movements of their time. It deals with their responses to such movements in areas as diverse as Ireland and India, Poland and China, and Russia and the United States, as well as in many other regions. Many of Max and Engels’ most significant statements on the national question were made in their journalism, occasional addresses and private correspondence – sources not always readily accessible to, or even known by, some of their more immediate successors. Subsequent publication of this previously-dispersed material has enabled a more coherent picture of their ideas on the subject to be drawn. Marx and Engels believed that national aspirations and the cause of socialism did not always go hand in hand and each national struggle had to be examined on its merits and judged according to whether its success would retard or enhance the prospects of a socialist revolution. Based on a wide range of sources, this study examines an important, yet neglected, area of Marx and Engels’ ideas and activities, and indicates the criteria by which they determined their attitudes at different times to a variety of national movements at work in four continents.